Have a need for innovative visual communications technology? 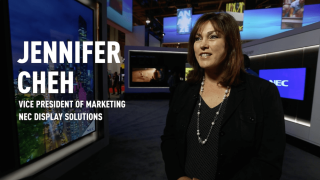 NEC Display Solutions’ VP of Marketing Jennifer Cheh has the solution for you. Whether it be the latest LED technologies with a variety of pixel pitches, high-bright displays in various orientations, laser projectors and more, find out how integrated display technologies in professional and personal environments help solve your real world business problems.